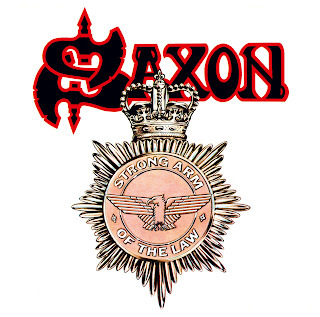 Following quickly on the heels of breakthrough album Wheels Of Steel, Saxon's second album of 1980 is more of the same. Strong Arm Of The Law leans towards a hint of increased maturity and more complete song writing, but the album still contains a few too many trite tracks and simplistic repetitions. The overall sound remains that of a band having fun with straightforward celebratory metal, the themes predictable, the solos limited, and the energy high. There is no denying Biff Byford's effort on vocals, and a few of the tracks do stand out, but Saxon were boxing themselves in to a predetermined sound as quickly as they were becoming popular. Heavy Metal Thunder opens the album with a purposeful beat and speeding tempo, Byford dominating over the band but ably supported by a buzzy riff. Strong Arm Of The Law is distinguished by a more deliberate structure and Byford's epic delivery of "Stop! Get out! We are the strong arm of the law", a line that could electrify any concert crowd. On the following four tracks from Taking Your Chances to Sixth Form Girls, the album hits a flabby underbelly of callow metal, none of the tracks getting past the most basic of melodies, often badgered with incessant repetition. This is either filler material from a band rushing to release a second album in eight months, or simply the band limitations harshly revealed. Thankfully the record ends on a much better note, Dallas 1PM demonstrating much greater ambition, finding a well-oiled and powerful mid-tempo groove in recounting the assassination of US President Kennedy. The guitars of Paul Quinn and Graham Oliver suddenly carry a threat, Byford can let the band charge alongside his vocals, the level of determined enterprise standing in stark contrast to some of the earlier material. Strong Arm Of The Law confirms Saxon's identify as an honest metal band with a limited scope but the occasional sparkle of brilliance. Produced by Saxon and Pete Hinton.